The Green Gym schemes offer us the opportunity to take part in conservation activities in local parks and green spaces to improve our local environment and simultaneously our health and fitness. HOT’s Zelly Restorick spoke to some of the people involved in Green Gym to find out more. The idea for the scheme originated in 1997, when GP William Bird participated in a practical conservation task day run by the then British Trust of Conservation Volunteers (now The Conservation Volunteers). He imagined how some of his patients might benefit from such a good form of exercise, especially as an alternative to the gym for those with an aversion to mirrors, equipment and tight-fitting clothes. He also saw health benefits in just being out of doors in the air – and how health might be maintained enjoyably. Combining his medical knowledge with that of the BTCV conservationists, the concept of the Green Gym was born – and with the support of the Department for Health, the NHS and various funding bodies, Green Gyms were set up around the whole of the UK. I spoke to one of the people working at The Church In The Woods site in Hollington, wood carver Marcus Cornwall, asking him what it’s like to be involved with the Green Gym. Michael, the leader of the 1066 Green Gym group, chips in to say that ‘Two hours of Green Gym is the equivalent of one hour of step aerobics – and is better in terms of calorific burn – and that both blood pressure and pulse tend to decrease after being out here’. He explained that Green Gym has been independently evaluated by the Healthcare Research and Development Department of Oxford Brookes University whose research showed that health improves when we’re involved with outdoor activities – and being outside is as good for you as other more conventional forms of exercise, improving both your physical and mental health. Do woodlands need managing? I spoke to Tim, ex national Green Gym programme manager and the person who oversaw the setting-up of the local projects, which he continues to do, about how the felling of trees could be viewed as destruction of a natural habitat. “There’s a lot of misunderstanding and misinformation about the management of woods. Almost all woodland in this country has been formed by man felling the trees for timber, to use in all sorts of ways over the centuries. 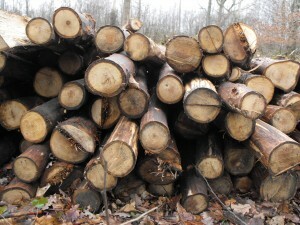 There’s no wild wood and very few areas are ancient, because man has managed the woodland for the past 3-4,000 years. Some people believe that if it wasn’t for man, there’d be trees all over the country… but archaeology doesn’t verify this. In the past, we’ve had mammoths, giant bears, woolly rhinocerus and all sorts of gigantic creatures, who would have pushed trees over on their travels – or other creatures would have eaten the baby trees. They’ve also impacted on nature and our surroundings. “Our landscape changes – it can be grassland, then forest, then heathland, as trees die off naturally too and they’re not always seeded in the same area. 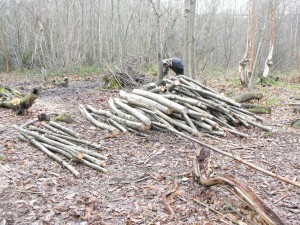 In Green Gym and conservation work, we cut the trees selectively. In a way, if offers the tree immortality, as they’re always in a juvenile state. They only exist because of being cut down roughly every 20 years. 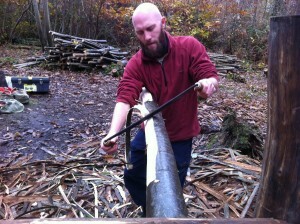 Some coppiced trunks have been analysed to be 1,000 years old. We’re not interfering at all with the root structure – and the roots are a living part of the tree. Our conversation moved on to predictions of planetary apocalypse – or maybe simply human apocalypse – and was mankind responsible? “Now could either be a time of huge crisis – or we could be on the cusp of re-evaluating our relationship with the planet that supports us. There have always been crises. Our local nature here has been formed by the last Ice Age. There have always been catastrophic events – meteors, changes in climate. Now? We’ve definitely sped things up. Nature is good at change, but at its own pace. It’s definitely a time of concern, seeing as we seem to be hell-bent in our demand for land, using up all the resources, reducing the bio-diversity – once something’s lost, it’s lost. The interaction between the plant and the animal species is a delicate balance. If we weren’t here, nature would re-claim everything. Can nature look after herself, I asked, without our intervention? Who can go along and participate in Green Gym activities? “A wide range of people come along to Green Gyms,” explains Michael, the lead facilitator with the 1066 Green Gym group, a community-run, community-led, independent group. The Green Gyms are initially funded with a goal to becoming self-supporting in the longer term. “Some people have some time to spare, some are interested in learning about conservation work, some just like to be busy, some aren’t working at the moment and enjoy the opportunity to get out of the house, some have been made redundant, some have health issues, either mental or physical, including a couple of guys with brain injuries. There’s no specific ‘person spec’. Everyone’s voluntary and nearly everyone feels better for participating and being outside in the fresh air. It’s an excellent form of rehabilitation. Trained and experienced leaders are on hand and activities range from gentle to strenuous, with you in charge of your own pace. Activities might include regeneration of ponds, promotion of woodland flower growth, maintaining footpaths, erecting fencing and handrails, building steps and bridges, creating habitats, rhododendron clearance and more. It’s free. No experience is necessary. Wear clothes you won’t mind getting dirty. Leadership courses are available and new leaders are being sought. You need to be reasonably fit and enjoy being outdoors. There’s no age limits, although if you’re under 16, you need to be accompanied by a parent or guardian. 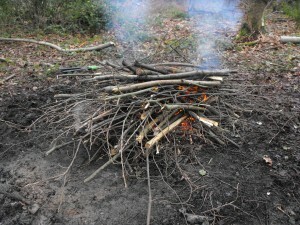 The Hollington Green Gym meet on Mondays and work in Church Wood Local Nature Reserve. The 1066 Green Gym group meet on Tuesdays and Thursdays, working on a number of sites, including Ashburnham Place, Methersham, a Grade II Garden in Brede, Ticehurst and private nature reserves. All in all, they cover about 700 sqare miles. Volunteering opportunities are also offered by The Conservation Volunteers (TCV) in Hastings, who’ve been meeting every Wednesday for 25 years. Contact TCV here. 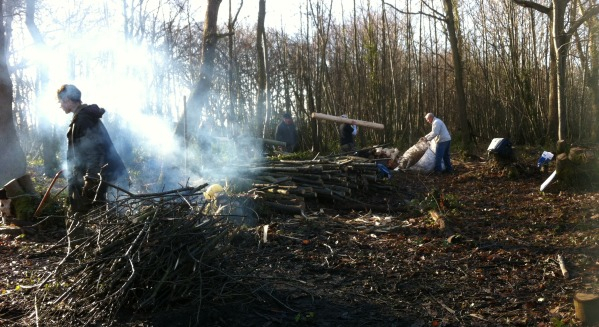 Or contact The Friends of Church Wood, where you can volunteer once a month.